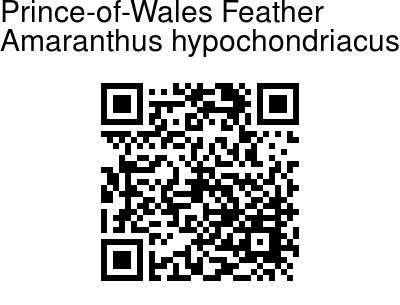 Prince-of-Wales Feather is an ornamental plant, originally from Mexico where it is endemic. It is grown as an ornamental worldwide, and is naturalized in many parts including the Himalayas. Stem is green or purple, 10-80 cm tall, branched, hairless or slightly hairy. Leaf-stalks are 1-7.5 cm, hairless. Leaves are rhombic-ovate or oblong-lanceshaped, 3-10 × 1.5-3.5 cm, hairless, base narrow, margin entire or wavy, tip pointed or long-pointed. Inflorescence is borne at branch ends, erect, cylindric, about 25 cm, 1-2.5 cm in diameter, branched or not, composed of many spikes. Lateral spikes are short, about 6 cm. 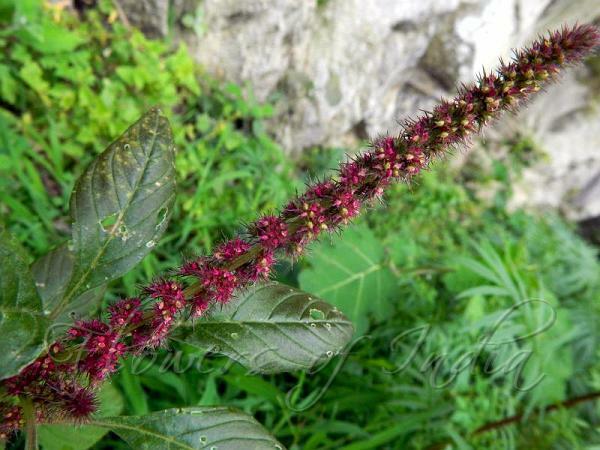 Bracts are green or purple, ovate, subulate, 4-5 mm, about twice as long as perianth, tip distinctly long pointed. Tepals green or purple, with a dark midvein, oblong, about as long as or longer than fruit, apex acute or acuminate. Stigmas 2 or 3. Utricles exceeding perianth, green, tinged purple above, rhomboid-ovoid, 3-4 mm, circumscissile. Seeds are white, nearly round, about 1 mm in diameter. Flowering: July-August. Photographed in Kalatope-Khajjiar Wildlife Sanctuary, Chamba, Himachal Pradesh.